They're north of the Appian way. The answer to whose credit is best in the euro zone is the same as whose cooking is Wurst. Aside from Germany, only three other EU members still enjoy AAA ratings: Finland, Luxembourg and the Netherlands. Most knowledgeable and objective observers agree, however, that it's only a matter of time before the latter three are knocked from the top rating level. First to go may be the Netherlands, whose minority coalition government resigned on Monday amid an impasse over budget negotiations. Long a fierce advocate of euro fiscal discipline, the Dutch could not agree on how to get their national deficit within the required limit of 3% of GDP, as opposed to the currently projected 4.6%. Discussions broke down after the right-wing Freedom Party, headed by the flamboyant Geerd Wilders, pulled out of talks with the center-right liberal party of Prime Minister Mark Rutte. Ratcheting up the tension, Moody's warned that a "weaker commitment to fiscal discipline" in the Netherlands could put "downward pressure" on the country's triple-A rating. 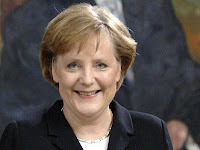 It may soon be einsam at the top for Germany.